These two full length videos reveal what the mainstream media does not want you to know. The Right Sector Neo Nazis which are an integral part of the coalition “government” are depicted by the NYT and the Washington Post as True Patriots and Nationalists. The horrendous crimes committed against fellow Ukrainians are not mentioned. Realities are twisted upside down. 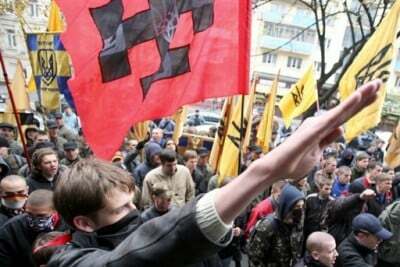 The CIA is involved in training and advising Right Sector Brown Shirts. Neo-Nazis heralded as Nationalists and Ultra-Conservatives are tacitly supported by the self proclaimed “international community”. In turn, the Western media is complicit in fostering the support of an illegal proxy regime integrated by Neo-Nazis. The crisis is casually blamed on Moscow. But the lies are being confronted by World public opinion. The credibility of Obama and his European allies is being questioned. Rebirth of Fascism in its purest form in today’s Ukraine. The Video has an age restriction. Login may be required.